Agra fort can be termed as Agra’s Zenith. The fort sprawls along 2.5 km on the banks of River Yamuna. 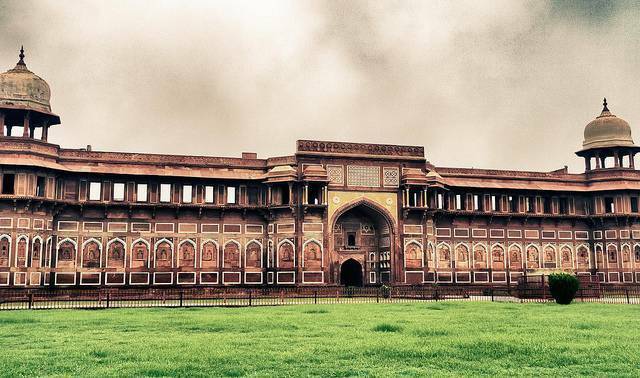 There are two gigantic gates to this fort namely “Delhi Gate” and “Amar Singh Gate”. However, the tourists are allowed only through “Amar Singh Gate”. Being built using the Redstone, tourists can see many buildings inside the fort like Diwan–e- Am, many mosques, vast courtyard, four palaces and the Zenana Mina Bazaar. The walls of marble pavilion rooms are cooled off by passing the water through the hollows on the walls. Tourists can get a spectacular view of River Yamuna from the balconies of Pavilion. The construction was started in 1156 and finished in 1605. As per the history, it is in this fort, Shah Jahan was imprisoned by his own Son. Shah Jahan spent his last term of life in this fort watching over the Taj Mahal, which he built for his wife Mumtaz. Because the Indian military is still using the parts of the fort, Delhi Gate is closed to public. Tourists enter via 'Lahore Gate' or Amar Singh Gate.